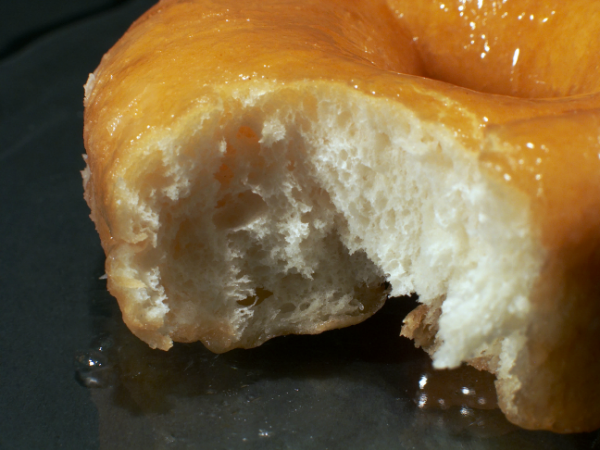 You won’t believe how quickly you can throw together this easy homemade doughnut recipe, mostly with ingredients you may already have in your kitchen. You can use other types of biscuits, but Pillsbury Grands Buttermilk work really well. I haven’t had good experiences with the low-fat varieties of biscuit rolls. I’ve been told these donuts are as good as Krispy Kreme’s, which is high praise around here. Heat the oil on medium high in a dutch oven on the stove until hot enough to hiss when you throw water droplets on it, about 10 to 15 minutes, depending on your stove. Gently separate the biscuits and use the one-inch round cutter to remove the doughnut holes. Set aside the holes. Once the oil has sufficiently heated, gently place the doughnuts into the oil using the ends of your wooden spoons, and watch them carefully. It won’t take them long to start becoming a nice, golden color, at which point, turn them over using the small ends of the wooden spoons, and watch carefully until the other side is also done. Again using the wooden spoon ends, remove the doughnuts from the oil and place on a paper-towel lined plate to cool. Cook doughnuts in two or three batches, then cook the doughnut holes as well. Mix the glaze ingredients together until smooth, then dip the warm doughnuts into it using, you guessed it, the wooden spoon ends.